The most prevalent form of chronic illness in this country, autoimmune diseases affect nearly 23.5 million Americans. This epidemic - a result of the toxins in our diet, our exposure to chemicals, heavy metals, antibiotics, and unprecedented stress levels - has caused millions of people to suffer from diseases like Graves' disease, rheumatoid arthritis, Crohn's disease, celiac disease, lupus, and more. 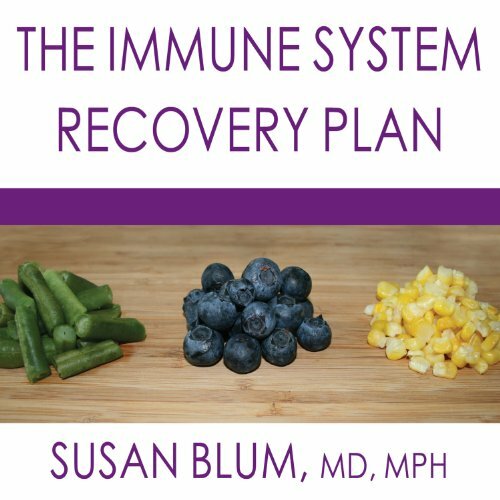 Now, Dr. Susan Blum describes the four-step plan that she used to treat her own serious autoimmune condition and helps countless patients reverse their symptoms, strengthen their immune systems, and prevent future illness. Dr. Blum's innovative method shows how to use food as medicine, understand the connection between stress and health, heal the gut and digestive system, and optimize liver function. The Immune System Recovery Plan is a groundbreaking, revolutionary way for people to transform their health. I agree with the author that the standard American diet of fast food, processed food, chemical additives, and high sugar intake is making large numbers of people sick. Overall, I found the material presented compelling. However, there were several places in the book where I felt that Dr Blum may have jumped too quickly from point A to point D (skipping over points B & C) possibly rushing to find "the" answer precipitously. In reality, the physiology and pathology of the human body is anything but simple. The book is filled with information and gentle encouragement. I particularly liked Dr Blum's holistic approach--looking at the individual from all angles. Diet, life style, exercise, supplements & vitamins, stress control, mind/body instruction and symptom management are all addressed. The book is very helpful whether you have an autoimmune diagnosis or are trying to prevent an autoimmune disease from developing. The narration was a bit strange as the voice almost sounded robotic or machine generated. This wasn't enough to make me stop listening. I would suggest a listen to the sample first, but keep in mind that the material presented is worth coping with the odd narration. I wish all endocrinologists or even all doctors read this book before they prescribe drugs to patients. most doctors have very narrow knowledge in their specific area and they don't even bother to look outside. five stars! I am inspired and finally have hope! I've been sick for years but nothing diagnosable, or I couldn't find the right doctor that would ask all the questions and listen to my answers. I just keep going back to doctors saying something is wrong, why are my thyroid numbers suddenly off, why was there damage to my optic nerve why is every joint in my body in pain when I'm 42 and seemingly healthy? I can't wait to the results of Dr.s Blum's tests and work. What made the experience of listening to The Immune System Recovery Plan the most enjoyable? This book is very detailed and that is what I like. It talks about diseases and tell how you can get tested, what kind of blood test you need and what the results should be. Yes this book is one of those that you just want to keep listening but there is so much information that I keep coming back and re listening some parts. incredibly thorough, helpful, and empowering! Dr. Blum systematically explains and dissects each disease, suggesting food for healing, testing, explanation of results. Arm yourself with this knowledge before it is too late! you can prevent harmful debilitating autoimmune diseases!! Where does The Immune System Recovery Plan rank among all the audiobooks you’ve listened to so far? This is a must read for anyone with any of these: pain, inflammation, rashes, fatigue, joint swelling.... pretty much any condition whether or not autoimmune in nature by diagnosis. Dr Blum tells a common sense, science-backed story of healing and recovery. A friend is being weaned off of MS drugs by her physician because of this book, but prevention, to me is its greatest value. Everyone should read this book to help prevent autoimmune disease. This is a step by step book; one good to read and set down while implementing the lifestyle changes she recommends. Would you listen to The Immune System Recovery Plan again? Why? I have to listen to it again! She provided such detailed information and correlations. I knew some of the things she lays out in the book. I know them because I listen to my body, even though doctors do not agree with my observations. So glad to hear what I consider a sane, non mainstream perspective that is results oriented. Detailed, positive information presented in a clear and understandable manner. Many explanations, examples and suggestions provided with empathy and encouragement. I loved this book! I wish it was longer! Definitely worth the read! Want to fix your health? Do it now. Listen. It's the first book that has finally understood my pain with autoimmune and has direct resources on how to heal! Thank you Dr. Blum!